I had described for myself the pattern of Muriel Rukeyser’s early life with the words “independent, active, and spontaneous” — the best “ingredients” for a narrative biography. But going on to assemble the rest of the lifeline, I found a very different pattern from that of the first 3 years: something more static, something more staid. I felt dismayed by this and for the first time, I found myself approaching Muriel and her life as an abstraction, as an exercise in biographical structuring, as a problem, rather than a phenomenon to be dealt with however and exactly as it appeared. Perhaps because I myself–a teacher, scholar, and mother fairly late in life–have wondered about the transformation motherhood has wrought in my own life, I found myself arrested and even disturbed by Daniels’ assertion. I, too, have sensed that Rukeyser’s work was deeply affected by the experience of motherhood, but (perhaps for self-serving reasons) I tend to put a more positive spin on that change. I wonder, for instance, if her enthusiasm for technology and its potentials waned after world war two, the atomic bombing of Japan, and the birth of her son. In her 1962 poem “Waterlily Fire,” Rukeyser appears to embrace pacifism and a commitment to the work of peace grounded in her appreciation for Zen Buddhism, Hinduism, and the archetypal role of women as the bearers and preservers of life. I tend to think of this transformation as a redirection, rather than abandonment, of earlier energies and commitments. immediate decline in literary output after the birth of [Rukeyser’s] son, the way in which she chose not to become involved in the San Francisco poetry renaissance which was underway during the time she lived there (she was too busy “pushing a baby carriage,” she later explained). Certainly this insight helps explain why the apparent resurgence of interest in Rukeyser in the 1960s and 70s did not result in scholarship and critical discussions of her work, not even among feminist critics. Daniels’ essay leaves me with a lot of questions, both about Rukeyser’s life choices and about the curiously unstable place of other women poets in American Literary History. Most of all, I find the honesty of Daniels reflections galvanizing. Daniels discontinued her biographical project–it will be interesting to find out why, but perhaps this essay offers a clue? 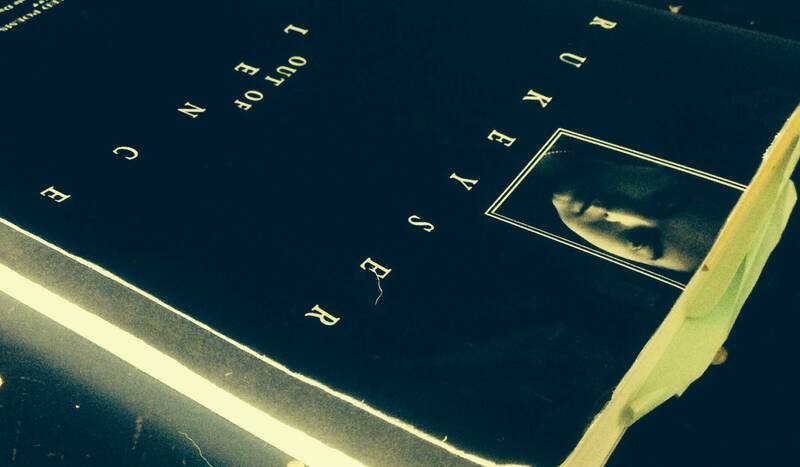 Fortunately, somebody else, Jan Heller Levi, has taken on the task of writing a biography of Muriel Rukeyser. Last I heard, the biography will be published by Knopf, in 2013.